Doctors Park of Mt. Shasta ◊ Our Physicians: Peter Grant, M.D. Our Physicians: Peter Grant, M.D. After being born in San Francisco, Dr. Grant lived with his military family in Germany until age 5. He then grew up in San Antonio, Texas where he graduated from the University of Texas with Honors. Dr. Grant then attended Texas Tech University School of Medicine followed by his internship and residency training in the department of Physical Medicine and Rehabilitation at Ohio State University Hospitals in Columbus, Ohio. 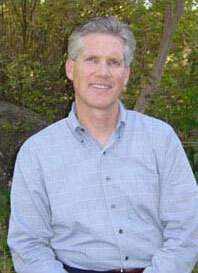 In 1986 Dr. Grant moved to Medford, Oregon to set up his private practice. Dr. Grant holds two specialty Board Certifications. First, he has been certified by the American Board of Physical Medicine and Rehabilitation. Physical Medicine and Rehabilitation is a medical specialty dealing with the diagnosis and treatment of disorders of muscles, nerves, soft tissues, and the spine. Secondly, Dr. Grant is also credentialed by the American Board of Electrodiagnostic Medicine. Electrodiagnostic Medicine is the medical discipline dealing with specialized testing to identifying problems with nerves or muscles. Dr. Grant is currently serving a 3 year term on the Board of Directors of the American Association of Electrodiagnostic Medicine (AAEM) and has been the editor of this organization’s international newsletter Positive Waves for the last 5 years. Over the last 7 years he has been on oral examiner for the American Board of Electrodiagnostic Medicine (ABEM) helping the organization in the credentialing of other doctors taking this Board Certification examination. Dr. Grant has lectured locally, nationally, and internationally on numerous topics including Carpal Tunnel Syndrome, electrodiagnostic evaluations of neck and back problems, nerve entrapments and other nerve injuries, and muscle problems such as myofascial pain syndromes. He is an active member of numerous organizations including the American Association of Electrodiagnostic Medicine (AAEM), the American Association of Physical Medicine and Rehabilitation (AAPM&R), and the Physiatric Association of Spine, Sports, and Occupational Rehabilitation (PASSOR). Dr. Grant and his wife Joan have six children - Jessica (19), Collin (16), Austin (15), Keenan (11), Stewart, and Weston (3). When not working he enjoys being with his family most of all. Dr. Grant is active in his church and enjoys traveling, playing tennis, hiking, playing basketball, and skiing.